Today we have Ashley from Simply Designing sharing her craftiness with us. There are tons of burp cloth tutorials out there, but I love Ashley's tutorial! I love that these are double sided... so fun and colorful! You'll never need to buy burp cloths again! 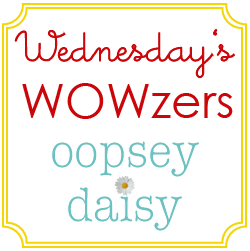 Hello Oopsey Daisy readers!! 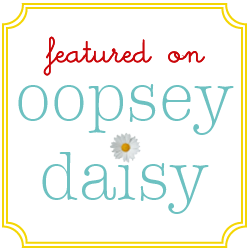 I was so excited to have been invited to guest post here during Baby Week! What an honor! I am Ashley, the face and voice behind Simply Designing! I am fairly new to blogland but am loving every minute of it! I am an interior designer and a floral designer. I own my own business. I also love to dabble in crafts, baby/child items, sewing, baking, cake decorating and a variety of other things. I love finding ways to make my life more SIMPLE! In addition, I am a wife to a wonderful husband for 9 years, and a mom of a 3.5 year old spunky little girl and a sweet cuddly 3 month old little boy! So much fun! Ok. Now. On to the GOOD stuff! 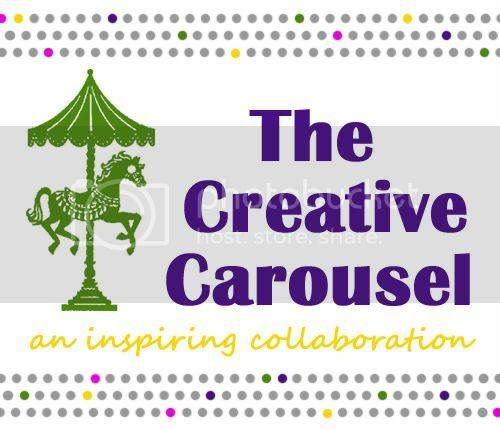 I am so excited to be guest posting here today. I am actually going to show off a tutorial that has been one of my most popular tutorials! It is so much fun! I just love it! 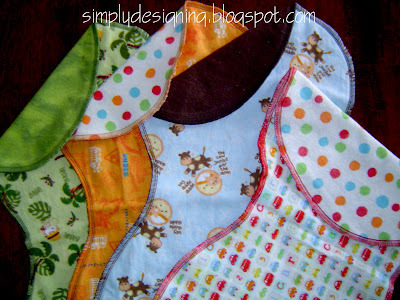 I wanted to share with you my tutorial for making simple, but the best EVER, Burp Cloths! 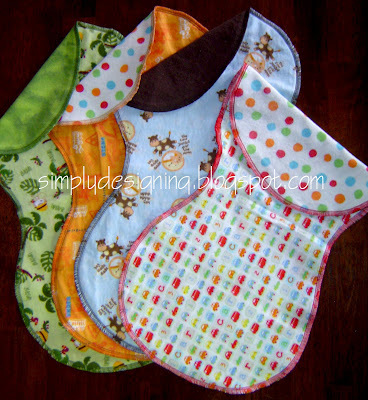 I made similar ones to these for my daughter but also received a myriad of other burp cloths at her baby shower. These were by far the most functional and the cutest! I recently made some in anticipation of our son’s arrival, so these are more “boy” oriented ones, but you can obviously use any prints you want to. I was lucky and found my fabric on a 50% off sale! Then I had a coupon for 20% off your entire purchase, even sale items. So, I figured my cost was 80 cents per burp cloth! (Plus the thread costs, but since we didn’t need to buy new thread…). So not only are they the best burp cloths, they are also the cheapest! I know it is not a lot of fun, and I accidently left my flannels in the dryer too long and they became entangled and wrinkly (Yes, I then had to iron them before I could cut them out…don’t make that mistake! ), but prewash your flannel fabrics. You will be SO happy you did this! If you don’t, they will shrink and cause the edges of your burp cloths to become wavy and then your burp cloths will not look nearly as good and, if you are like me, you will want to iron your burp cloths, which really is a ridiculous thing to have to do. So please, avoid the heartache and prewash all your flannels before you get started! Step 2: Create your Pattern! Use the following dimensions and photograph to sketch out your burp cloth pattern on to an open brown paper grocery bag. This does not have to be perfect, but try to get it as symmetrical as possible. However, remember that you will be serging around these so that will make up for some discrepancy in this step. Once you have the pattern sketches on the bag, cut it out. Fold your fabric in half. You will be cutting two burp cloth sides at a time. These burp cloths are double sided and made with 2 pieces of flannel each. (1/3 yard fabric yields 2 burp cloths sides). If you are really adventurous, you can put two, folded fabric pieces together and cut four sides at a time. However, if you try this, be sure to pay attention that the pattern fits in all directions on all fabric layers otherwise you may end up with a short burp cloth in there. Oops. Pin the pattern to both thicknesses of flannel and cut! I like to cut all my burp cloths at the same time before moving on. Decide how to pair your fabrics. You will use two flannel pieces to make one burp cloth. You can, of course, use the same pattern for both sides of the burp cloth, but I like to mix mine up! Once you have figured out your pairing, place both sides, right-side out together. Ok, well I fall into the group who does not own a serger. But I do know someone to owns a serger so I enlisted help for the final step of this project: serging the edges together! With wrong sides together (right sides out), serge around the outside edge in either a matching, complementing, or contrasting color of thread, your choice! Step 6: Use and Wash…or give away! Use these burp cloths often and wash them to death! They will absorb better after each wash! 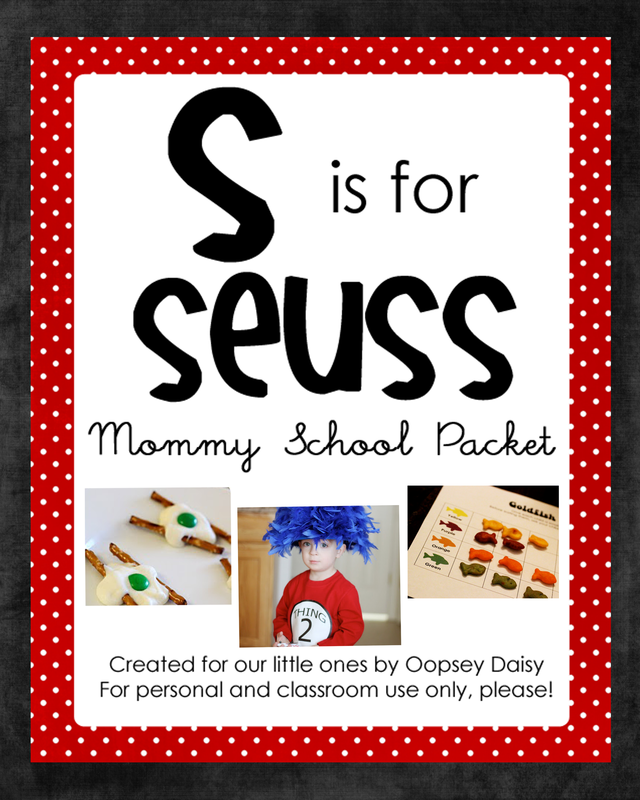 Or make to give away as baby gifts! And that's how it's done wonderful Oopsey Daisy readers! Simple, but the best EVER, burp cloths! Thank you so much for letting me come and share my tutorial with you. Be sure to stop by my blog Simply Designing HERE to poke around and check out some of my other posts and tutorials. Stop by, stay a while, leave a fun comment, become a follower...I love it all! Also, check out my Etsy shop HERE for this burp cloth template and for other little girl and baby accessories!